A test case for a national effort to bring so-called “children’s” lawsuits backed by deep-pocketed philanthropic foundations in more than a half dozen states reached federal court Monday. Underwritten by several foundations, including the Leonardo DiCaprio Foundation and Rockefeller Brothers Fund, and with most of the 21 young people who filed the lawsuit in attendance, the plaintiffs argued for the case to move forward to trial. “It is really extraordinary. Plaintiffs seek unprecedented standing to pursue unprecedented claims in pursuit of an unprecedented remedy,” Deputy Assistant Attorney General Eric Grant told the three-member panel of the 9th Circuit Court of Appeals. The three-member panel includes two Clinton appointees and a Reagan appointee. All three judges expressed skepticism of the lawsuit’s potential for success to varying degrees, though the Clinton-appointed judges—Judge Marsha Berzon and Chief Judge Sidney Thomas—appeared hesitant to grant the administration’s lawyers’ request to halt the lawsuit before reaching trial. Dr. James Hansen, former director of the U.S. NASA Goddard Space Institute, also attended the proceeding. Hansen helped connect Olson with another child plaintiff previously, when Olson was looking to find children who would act as plaintiffs in a lawsuit against government agencies. Hansen, inspired by his own grandchildren, believed that a turn to the courts would provide relief. “The judicial branch is much less influenced by special interests such as the fossil fuel industry,” Hansen told The Atlantic in 2012. Olson’s inspiration for inviting children to bring lawsuits stems from her colleague Mary Christina Wood, law professor at the University of Oregon, who first introduced “Atmospheric Trust Litigation” as a brand of the public trust doctrine in law. “Under this doctrine, a state or third-party corporation can be held liable for stealing from or damaging a resource—in this case, the atmosphere—that is held as a public trust. The beneficiaries in the case are citizens—both current and future—who claim that the defendants (the state or federal government or third-party corporations) have a duty to protect and not damage that resource, which they oversee or for which they bear some responsibility,” the report’s authors wrote. “Wood noted that this legal action has several promising features: it is being brought by children, can highlight local impacts of climate change because it is being brought in every state, and is flexible enough to be brought against states, tribes, the federal government, or corporations,” the report continued. A landmark 2009 lawsuit brought against utilities by six states was blocked by the U.S. Supreme Court in a unanimous decision in 2011. The nation’s highest court ruled that the Environmental Protection Agency held the authority to regulate greenhouse gas emissions, not federal judges. This reversed a lower court decision that would have allowed the lawsuit to proceed to trial. “In a world filled with silly, frivolous, and undeserving lawsuits, these plaintiffs take the cake. It is difficult to imagine one that—to even the lay person on the street—is more ridiculous,” said William Perry Pendley, President of Mountain States Legal Foundation. “We have confronted and defeated similar claims in Colorado where one plaintiff said she had standing because her grandchildren would no longer be able to ski in Colorado. There are much better things for federal courts to do than hear foolish lawsuits like this. Let us hope the Ninth Circuit does the right thing,” Pendley told Western Wire. 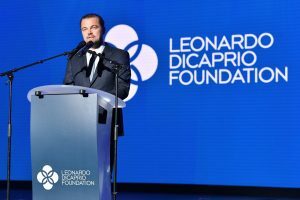 The Leonardio DiCaprio Foundation (LDF) sent $1.3 million to a host of recipients, including Our Children’s Trust, as part of $15.6 million effort. “LDF believes in supporting innovative approaches to galvanize action on climate change. Our Children’s Trust (OCT), is taking a novel litigation approach by representing the voice of youth in a groundbreaking climate change lawsuit against the U.S. federal government. The case has achieved notable success thus far and will be heading to trial shortly. OCT hopes to secure a legally binding ruling wherein the federal government would be required to act on climate change,” LDF wrote in a recent marketing brochure. The foundation has also established a $1 million rotating litigation fund. Other foundations contributing to Our Children’s Trust include the Walker Foundation ($45,000), the Noya Fields Family ($20,000), and the Bauman Foundation, which issued a grant for $1,000 for general support. Our Children’s Trust lists more than a dozen institutional funders, including those previously mentioned. They join the Cottonwood Foundation, Charles Engelhard Foundation, Elizabeth Lafayette Fund, Global Greengrants Fund, Jubitz Family Foundation, Libra Foundation, MRG Foundation, Northwest Fund for the Environment, Oregon Community Foundation – Evergreen Hill Fund, Patagonia , and Wallace Global Foundation. Our Children’s Trust lists judicial actions pending in seven other states: Alaska, Colorado, Maine, Massachusetts, New Mexico, North Carolina, and Washington. The group also lists ongoing legal action and administrative decision-making in all 50 states. Colorado’s lawsuit was brought by Xiuhtezcatl Martinez and other teenagers, and in March a three-judge panel at the Colorado Court of Appeals ruled 2-1 that the Colorado Oil and Gas Conservation Commission must consider whether drilling activities “adversely impact human health” or “contribute to climate change” before issuing a drilling permit. Colorado Attorney General Cynthia Coffman in turn has asked the state Supreme Court to review the decision, reaffirming the unanimous decision of COGCC to appeal the case to the state’s highest court. In New Mexico, the state Environmental Improvement Board, voted 4-1 in August to deny the request to have a full hearing on a proposed rule on CO2 and GHG reduction brought by 28 young people, aged 4 to 20, and the nonprofit organization WildEarth Guardians, according to Our Children’s Trust. “A long line of cases has found that valid concerns over the effects of climate change are, by design, better addressed elsewhere within the federal government. However, in the mind of the activists, the alternatives to legal action aren’t very compelling, and to the plaintiffs’ bar, they are not very lucrative,” Linda Kelly, Senior Vice President and general counsel for NAM, wrote in a recent op-ed.